There?s a new initiative in the Rye City School District with a name that may initially seem counterintuitive ? Challenge Success. The goal of the research-based educational reform program out of Stanford University?s Graduate School of Education is to task high-achieving communities to ask if their priorities are in line with students? best interests and overall well-being. Superintendent Dr. Eric Byrne expanded on the premise. ?Challenge Success? research has found that students in high-performing schools in towns like Rye, Bronxville, or Scarsdale, believe success equates to having the perfect transcript and being accepted into one of a very small number of highly-regarded colleges or universities. The pressure this puts on students causes a great deal of stress and results in many other negative impacts.? Principal Patricia Taylor is a front-row observer of the emotional drama that plays out throughout high school, primarily due to the pace and pressure in the pursuit of academic perfection. She is enthusiastic about the opportunity to re-evaluate the status quo. ?Challenge Success gives all of us a chance to reflect on our practices and priorities. Past practices don?t always have to be the best practices.? Last summer, a small group of Rye faculty members and administrators participated in a Challenge Success leadership training seminar in Boston. In early September, a ten-member Leadership Team, comprised of three high school and middle school administrators and teachers, two parents, and two students, traveled to Stanford University to attend a more intensive conference. 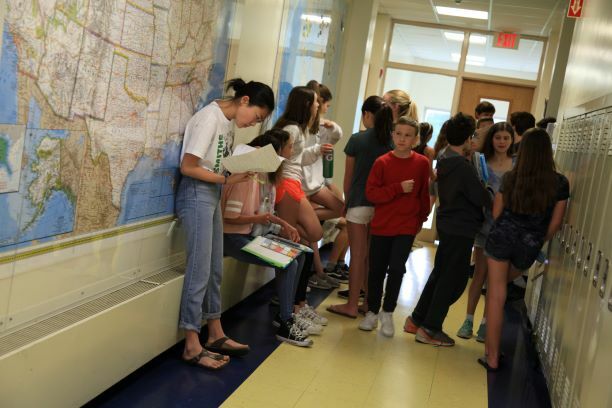 Parent liaison Mary Capaldi, former RHS Parent Organization President and the mother of two high school students, noted, ?Academic pressure and general anxiety have been on the rise in many high-performing districts. It?s in our children?s best interest to help them find more balance in their academic and personal lives.? She continued, ?The conference at Stanford was attended by 400 people from 50 school districts across the country. The workshops focused on child development, student engagement, alternative curriculum, assessment, and grading methods. The dialogue among our team members has been wonderful.? Dr. Byrne explained the process. ?Challenge Success works with school districts to gather data about student experiences and provides tailored information, tools, and strategies to create a more balanced and academically fulfilling life for students.? A critical part of the evaluation process is taking the pulse of the students? collective experiences and perspectives. In September, students in grades 6 through 12 took a survey which included a variety of questions on homework, extracurricular activities, sleep, physical health, stress, parent expectations, academic engagement, academic integrity, and faculty support. The results of the survey will form an action plan. Principal Taylor elaborated: ?The results will be compared to students from other high performing schools across the country.? Do our students have different expectations,?stressors? And how do they handle the academic expectations and stress?? The survey results and analysis will be presented to the community on January 7, 2019 at 7 p.m. in the RHS Performing Arts Center. All are welcome.